Similar Games in Different Countries. All children play games. The most basic games require very few specific items or equipment to play. They are created because of their simplicity and fun, making them accessible to everyone. It’s interesting that some games we are very familiar with from childhood, appear in similar forms all over the world. Are there reasons why we play, that are fundamental to all people? A lot of these games have a different appearance due to the culture they’re from, but are constructed in the same fashion. If you’re on learn English in Brighton, you’ll be meeting lots of people from all over the world. Being from England I can easily make comparisons to English children’s games I played in the past. But see if there are similarities to games you have played..
Chile: Corre, Corre la Guaraca. U.K: Duck, Duck, Goose! The fun-to-say name translates to “Run, Run, la Guaraca.” Chilean kids typically speak Spanish, but Guaraca is actually a nonsense word. In England we would play a similar game; Duck, Duck Goose. In Corre, Corre la Guaraca, a group of children sit in a circle with their eyes closed. One child runs around the outside of the circle with a handkerchief, while they sing Corre, Corre la Guaraca, those who look round will be bopped on the head. The runner attempts to drop the handkerchief on one persons back without them noticing. The runner then attempts to run a full circle around the group. If the person sitting down notices the handkerchief on their back, they chase the runner to tag them. If they tag them, the runner is out, if not they replace the runner. In the U.K children play Duck, Duck, Goose! In this game they a group sits in a circle, while one person goes around the outside. The person walking around, taps each person on the head or shoulders saying ‘duck’ each time. When they’re ready, they tap someone and yell ‘Goose!’, this person chases the tapper and tries to stop them from getting back into the circle. If they get back into the circle, the person left out side goes around the circle in the next round. If they are tagged by the chaser, they are either out or going around the outside again. Greek children have access to some amazing marble statues that date to ancient times. After a trip to the museum, it’s only natural that they would incorporate some of these awe-inspiring characters into an imaginative game. In Greek Statues, one player is chosen to be “It” and they stand, eyes covered, in the center of an open playing field. They start to count, at least to 10, but she can go higher. The point is that there’s no set ending number; only “It” knows when she’ll stop and open her eyes. While “It” is counting, the others scatter around, never sure when she’ll yell “Agalmata!” (That’s “statue” in Greek. Tell kids to yell it to be authentic, or to just say “statue” if that’s easier.) On this cue, players freeze, taking on poses that mimic famous statues. They can pull from any statue they’ve ever seen a photo of — a javelin thrower, The Thinker, even the Statue of Liberty. 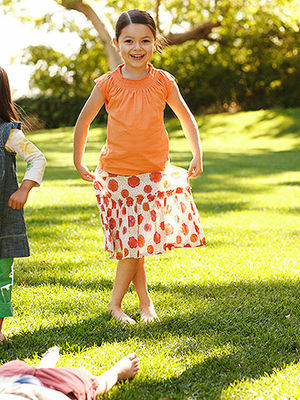 Kids are allowed to use found items, such as sticks, a ball, or a Frisbee, to add a touch of realism. “It” tags any statues that are moving — they’re out — then tries to make the steady ones laugh or move. The last player remaining composed is the winner and becomes the new “It.” This game is great for practicing balance. In the U.K there is a similar game with small variants. Instead of counting someone plays music through speakers in a large room, often an adult who isn’t part of the game per se. The children dance and run around while the music plays, when it stops they all have to freeze. Usually the person playing the music will watch and pick out anyone who is still moving after the music stops. Today, Korea is a modern nation, but with its history dating back more than 5,000 years, the country also retains a great deal of traditional culture. Korean children celebrate many festivals throughout the year, with colorful costumes and special foods. Player 1 scatters five small stones on the ground. He then picks one up and tosses it in the air and quickly tries to pick up another stone in time to catch the one he just threw. Now he has two in his hand; he throws one of the stones up in the air, and picks up a third. This goes on until he has all the stones in his hand. In the second round, the player picks up two stones every time he throws one up. In the third round, he picks up three; four in the fourth, and the fifth time he picks them all up. For the game’s last step, the player tosses all the stones in the air and tries to catch them on the back of his hand. Then he tosses them up again and tries to catch them in his palm. The number he catches is that player’s score. If he fails to catch them all, it’s the next person’s turn. Knucklebones, Tali, Fivestones, or Jacks, is a game of ancient origin, usually played with five small objects, or ten in the case of jacks. Originally the “knucklebones” (actually the astragalus, a bone in the ankle, or hock) were those of a sheep, which were thrown up and caught in various manners. Modern knucklebones consist of six points, or knobs, proceeding from a common base, and are usually made of metal or plastic. The winner is the first player to successfully complete a prescribed series of throws, which, though similar, differ widely in detail. The simplest throw consists in tossing up one stone, the jack, and picking up one or more from the table while it is in the air. This continues until all five stones have been picked up. Another throw consists in tossing up first one stone, then two, then three and so on, and catching them on the back of the hand. Different throws have received distinctive names, such as “riding the elephant”, “peas in the pod”, “horses in the stable”, and “frogs in the well”. The large Indonesian island is home to the Sumatran elephant, which has made its way into this kids’ game. Children play Semut, Orang, Gajah to determine the first player in a game or simply for fun. Players pump their fist up and down to the count of three. On four, they straighten their arm and give one of three signs: Pinky out is “ant” (semut), pointer finger out is “man” (orang), and thumb out is “elephant” (gajah). The elephant beats man because it is stronger; man defeats the ant because he can step on it and squash it. And the ant? It can crawl into the elephant’s ear, bite him, and drive him crazy, so the ant beats the elephant. If players make the same signs, they go again. Two out of three wins. In the U.K the game goes by the name Rock, Paper, Scissors and is in principle exactly the same concept. Players pump fists up and down to the count of three, sometimes declaring ‘Rock, Paper, Scissors’ as they do it. On the count of four the choose one of three signs; a fist to represent a rock, a flattened palm and fingers for paper or index and middle finger pointed to represent Scissors. Scissors beat paper by cutting it, paper beats rock by wrapping it and rock beats scissors by blunting them. During midsummer, when fresh apricots are in season, Israeli kids play games with the small, smooth pits known as go-gos, which are plentiful and perfect for tossing. They tote customized boxes and challenge their friends to toss pits for points. With a grown-up’s help, players must first prepare their boxes by cutting six holes of varying sizes along the lid’s top. The smallest hole should be just slightly bigger than the go-go, the others incrementally larger. Each hole is given a point value, usually 1 (for the largest opening), 2, 5, 10, 50, and 100 (for the most challenging hole). The game begins like this: Standing about five feet away (or closer if that’s too difficult), a player tries to throw one of his pits into another player’s box. If he makes it, the point value of the hole determines how many go-gos that player must give him. If he misses the box entirely, he loses his one go-go. So kids don’t have to lug around buckets of pits or stones (on the chance someone gets one in the toughest hole, he’d have to pony up 100! ), feel free to lower the point values on the smaller holes. Kids can also personalize their shoe box by decorating it if desired. This really reminds me of the British and Irish game of Conkers, as they both use a seasonal fruit. Except in conkers it’s a seed, the seed of the horse chestnut tree. Players collect these seeds to find the best one for the games purposes. 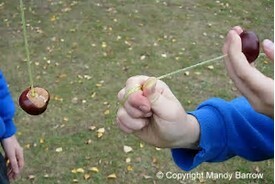 They thread a piece of string through their conker. To play the game, players take turns in swinging their own conkers at their opponents. Whoever’s breaks first looses. Some people would cheat by slightly baking their conker to make it extremely tough. Happy Easter from EC Brighton!